Gorgeous Burritt hand colored Map of the Heavens. 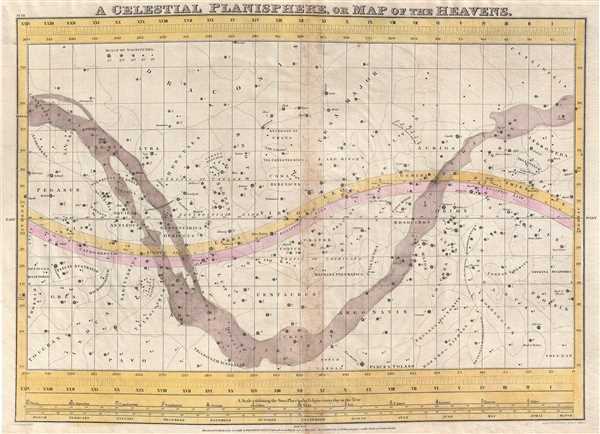 This is a rare and beautiful 1833 hand colored map of the night sky by Elijah Burritt. Centered on the ecliptic Line, this map identifies the various zones associated with each major constellation. The Milky Way is shaded. A scale exhibiting the sun's place in the ecliptic at various times of the year appears at the base of the map. This map, like all of Burritt's charts, is based on the celestial cartographic work of Ignace-Gaston Pardies and Johann Gabriel Doppelmayr. The map was engraved Illman and Pilbrow under the direction of E. H. Burritt and issued as plate no. VII in the 1833 first edition of F. J. Huntington's Atlas, Designed to Illustrate the Geography of the Heavens. There are several editions of this atlas, the most common being the 1835 by Burritt. Only the earliest editions are colorized. Very good. Minor wear along original centerfold. Small tear repaired at center.